13st 10lb (so it’s true: bingeing really does help you to lose weight); zero alcohol; 1,388; Longframlington. Obviously I won’t actually qualify for an obituary in The Daily Telegraph when I die on 4 February 2012, but if I did I’d like to think it could be as succinct as today’s summary of Patrick Hillery, President of the Republic of Ireland from 1976 to 1990: “As president, Hillery’s main achievement was the restoration of stability to the office; this he accomplished largely through invisibility and silence.” Sounds like the ideal job for me. I could do that. I shall write off for an application form immediately. Meanwhile, in the “you could not make it up” department, the PR genius in 10 Downing Street, about whom I wrote rather scathingly in the local paper yesterday, has now despatched his master on a profile-raising visit to the United States - arriving at precisely the same time as the Pope. Clearly my observations were nothing like rude enough. The essence of public relations is little more than the application of common sense, and that seems to be singularly lacking here. When you want to achieve big headlines with some positive news, pick a day when there is not much going on. When you’ve got bad news, try to sneak it out when the media will be otherwise engaged, but don’t be too bleeding obvious (e.g. putting out lousy company results on Budget Day or Christmas Eve) or it will undoubtedly backfire. And if you want to get some interest from the US media, don’t arrange for your boss to turn up on the same day as a head of state who is also the leader of one of the world’s great religions, and celebrating his 81st birthday. Still, it does confirm a trend of Gordon being unable to do anything right. And it is quite funny. Even without all that, the day would have started rather well, with my rendezvous with the scales revealing that I am now a full two stone lighter than when I started my efforts to shed a few pounds on Boxing Day. But things went rapidly downhill as soon as I got to my desk, as I fell victim once again to the monstrous tyranny of the e-mail. 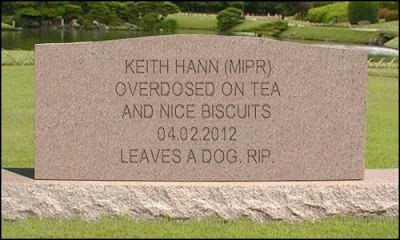 When they come to prepare my tombstone, I rather fancy “Unfortunately, e-mail got in the way” for my epitaph. It is therefore important for me to remind myself that, the last time I felt myself losing my footing on the slippery path to Love, it was with a similarly amusing and flirtatious e-mail correspondent. After a bit I looked her up on Facebook and found myself staring open-mouthed at a big, fat, spiky-haired lesbian who might well have been the model for Millie Tant in Viz. I can’t swear for a fact that she is, in fact, a lesbian, but let me put it this way: any other lesbian who received a brush-off after trying to pick her up in a bar would be fully entitled to initiate an action under the Trades Description Act, with every chance of success. At lunchtime, I met my aunt and my brother to celebrate the latter’s recent 70th birthday: two pints of Guinness, baked mussels with a garlic crust, roast beef with all the trimmings, bannoffee roulade with chocolate ice cream, and coffee and mints. No, not between us. That was just mine. I don’t think it will have done my diet a power of good, somehow. But on the other hand I felt I had a duty to world science to put the bingeing theory of weight reduction to a really serious test.